Get macros for your microbes in a chocolatey bar made with naturally sweet ingredients and plant-based protein—plus probiotics and an exclusive prebiotic blend. When hunger strikes and your tummy starts to rumble, it’s time to get your snack on. You have a lot of options, but not all snacks are created equal. Reach for a USANA WholeBio™ Microbiome Nutrition Bar. It will satisfy your craving for something sweet with ingredients that also provide extra care for your tummy. Each delicious bar will fill you up while it feeds your good gut bacteria. And the result is a healthy body and happy belly. 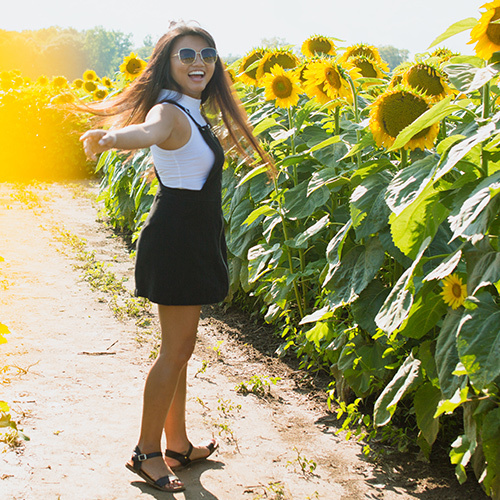 Your day isn’t going to conquer itself. And you need the right nutrition to keep going for the win. But your average snack only gives you average ingredients. You deserve more. Choosing a nourishing snack that’s a good source of protein, high in dietary fiber, and full of beneficial fat is already a better choice for your daily well-being. And each delicious WholeBio bar is also a snack with a purpose. It does more than conquer your hunger and nourish your body with whole-food ingredients. The bar also boosts your health by supporting your gut microbiome. Your digestive system is central to your overall health. This is because digestion is responsible for breaking down your food, so the nutrients can be absorbed and used to power your whole body. Your gut sends and receives hunger signals to let you know when you’re hungry and when you’re full. And, it plays a key role in supporting healthy immunity, which is responsible for helping to keep you well. But your gut doesn’t act alone. You have as many, if not significantly more, bacterial cells living in your gastrointestinal (GI) tract as there are human cells in your entire body. 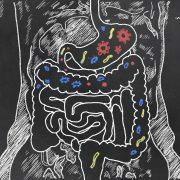 These bacteria work together with your human cells by communicating through cell signaling to keep your digestion on track. The many different types and strains of bacteria (and the other microbes) in your GI tract make up your gut microbiome. And maintaining a healthy microbiome is vital for keeping your digestive system functioning properly. Unfortunately, age, stress, and other lifestyle factors can negatively influence your gut microbiome. There’s something you can do to help bring the good back to your belly—eat with your good bacteria in mind. What you choose to eat every day has a direct impact on the bacteria in your gut microbiome. So, it makes sense to feed the good bacteria with foods that will help them flourish, known as prebiotics. And boosting your beneficial bacteria by adding more with probiotics can also help you maintain a healthy balance. The USANA WholeBio Microbiome Nutrition Bar supplies nutrients that do more than simply fill you up. The whole-food ingredients in every bar help support a balanced gut microbiome by supplying dietary fiber and other ingredients that promote digestive health. And the WholeBio bar goes a step further by also delivering gut-friendly bacteria at the same time for a bigger boost of belly benefits. The WholeBio bar contains a proprietary blend of highly effective prebiotic starches and functional fibers. It was custom formulated by USANA scientists to help feed your beneficial bacteria. The blend includes fruit powders that contain phytonutrients from apple, blueberry, and raspberry fibers. 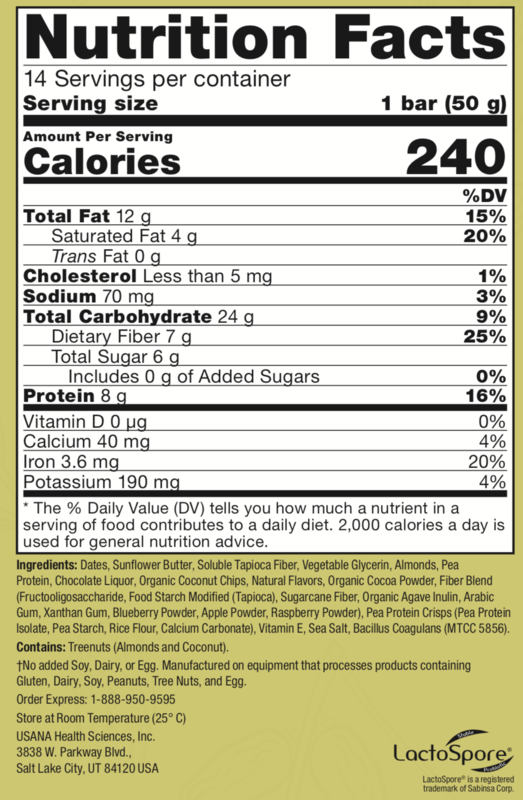 Plus, it contains a mix of short-chain fructooligosaccharides, oligosaccharides, and inulin. These are different types of carbohydrates that come from the natural sugars in plants, like sugarcane, agave, or cassava (the source of tapioca). Prebiotic fibers are unique because they resist digestion and pass through the stomach whole. When the fibers reach your lower GI tract (your intestines), these healthy bacteria feed on them in a process known as fermentation. Fermentation in your gut may sound like trouble. But it’s simply how the bacteria consume the prebiotics. The byproducts released by this process are beneficial molecules that can activate important changes in the makeup or activity of your gut’s microbiome. These changes are how the good bacteria in your gut play different roles in keeping your body healthy. The production of important metabolites is one of the activities supported by fermentation of prebiotic fiber. Those metabolites are the end-products of the metabolism process, some of which are short-chain fatty acids (SCFA). These fatty acids play a number of roles in your health: They support the body’s normal healthy production of hormones and help produce nutrients, as well as support healthy blood glucose levels already in the normal range. SCFAs promote a proper pH level in the gut, which is just one of the ways they support your immune function. They also act as signaling molecules that influence healthy immune responses. One of the SCFAs produced by fermentation is butyrate, which plays a key role in the healthy activity of your GI system. It helps maintain the integrity of your gut barrier. And it’s the primary energy source of the cells in your colon. So, the WholeBio bar supports digestive health, in part, by helping to produce the SCFAs (like butyrate) needed to keep your gut and bowels functioning normally. Another vital activity of the bacteria in your colon is supporting the production of even more beneficial bacteria. The constant replenishment of your natural bacteria is crucial for maintaining a diverse, well-populated microbiome. This is no easy job. There’s a lot of competition because the colon is home to up to 1,000 different species of bacteria. A well-populated colon is helpful for supporting regularity, because bacterial mass can add bulk to your stool. The prebiotic fibers in the WholeBio bar were carefully selected for their ability to effectively stimulate the growth of good bacteria in your intestines. This includes increasing the amounts of various strains of Bifidobacteria and Lactobacillus, which are well-known as beneficial bacteria in the gut microbiome. The WholeBio Microbiome Nutrition Bar does more than nourish your natural bacteria. It also helps add more friendly bacteria to your gut. Every bar supplies Bacillus coagulans to further support your digestive wellness. The strain of bacteria in the WholeBio bar is a distinct type of probiotic that not only survives in the acidic stomach environment, it activates there. It thrives in the intestines to help increase beneficial groups of bacteria in the gut. 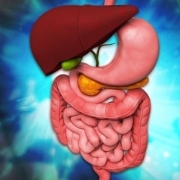 Some research has also found benefits for digestive health. So, the B. coagulans may enhance the activity of the prebiotic fibers in the bar to help create a more optimal environment in your gut microbiome. You can get even more digestive benefits by also using USANA Probiotic. The ingredients in the WholeBio bar will complement the supplement for more comprehensive support for a balanced belly. The WholeBio Microbiome Nutrition Bar can help you see a smaller belly on the outside while it supports a healthy balance on the inside. Because it’s a good source of protein and high in fiber, the WholeBio bar can help control your hunger. And at 240 calories, it makes a substantial snack that won’t leave you starving 30 minutes after you eat it. 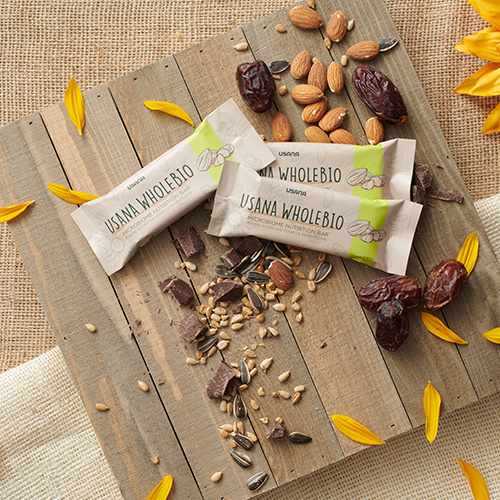 The dates and almonds in the WholeBio bar help deliver seven grams of dietary fiber. Studies have shown that people who eat more fiber tend to weigh less. One study reported that in a 20-month period, for every one-gram increase in total fiber consumed per day, body weight decreased by 0.25 kg (about half a pound). This is because fiber digests slowly, so it keeps you feeling full for longer. So, you eat less. The sunflower butter and pea protein in the WholeBio bar help provide eight grams of hunger-satisfying protein. Increases in protein have been found to help people lose weight as part of a calorie-restricted diet. This could be, in part, because protein takes more energy to metabolize in your body than carbohydrates. So, your body expends more energy during digestion. A healthy, happy life starts in the gut. Choose the snack that will help feed your whole-body health with USANA WholeBio Microbiome Nutrition Bar. †No added soy, dairy, or egg. No gluten-containing ingredients are used in this product. However, the WholeBio Microbiome Nutrition Bar is produced in a facility that manufactures other foods on equipment that also processes gluten, dairy, soy, peanuts, tree nuts, and eggs. Are there any side-effects of consuming the WholeBio bar? Sometimes the fermentation process in the colon can lead to temporary bloating and gas. However, the chances of this occurring with the WholeBio bar are low. The ingredients in the WholeBio bar were chosen because they work better together to reduce those side effects and support digestive comfort. And even though the WholeBio bar is delicious, avoid excessive consumption to keep your intake of prebiotics and dietary fiber at normal levels. Also make sure to drink plenty of water to keep the fiber moving smoothly through your digestive system. Can I give the USANA WholeBio Bar to my child or teen? The food ingredients in this bar can be consumed by children and teens without known allergies to any of the ingredients. However, we suggest that you start out feeding them only half a bar, especially for children. The amount of fiber and the type of protein in this bar could lead to some gastrointestinal discomfort if they are not used to the higher amounts provided in this bar. Is this safe to eat during pregnancy? 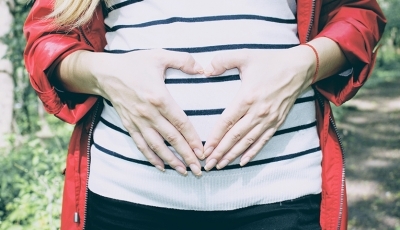 The food ingredients contained in this bar are typically fine to use during pregnancy. But as always, we recommend you talk with your doctor before taking any product with probiotics. Is it safe to eat this when taking other medications or supplements? Consult your doctor or pharmacist before eating the bar if you are taking medications. If you already take a fiber supplement, such as MySmart™ Fibergy® Plus, eating this bar in combination could be a very high dose of fiber to hit your gastrointestinal tract at one time. So, you may want to start with a half a bar and gradually increase to a whole one. But, in general, it should be safe to consume the WholeBio bar with other supplements, including USANA® Probiotic. Is it normal to have stomach discomfort after eating the WholeBio Bar? If you are unaccustomed to the types and levels of fiber and protein in the bar, you could experience some gastrointestinal discomfort after eating it. If you do experience discomfort, we suggest that you eat only half a bar each day to start, and gradually increase to consuming the whole bar over time. This is something that usually resolves itself after a few days or weeks, once your gut (and gut bacteria) has had a chance to adjust to the fiber level and the types of proteins in the bar. However, if you experience severe discomfort, you should discontinue use of the bar. 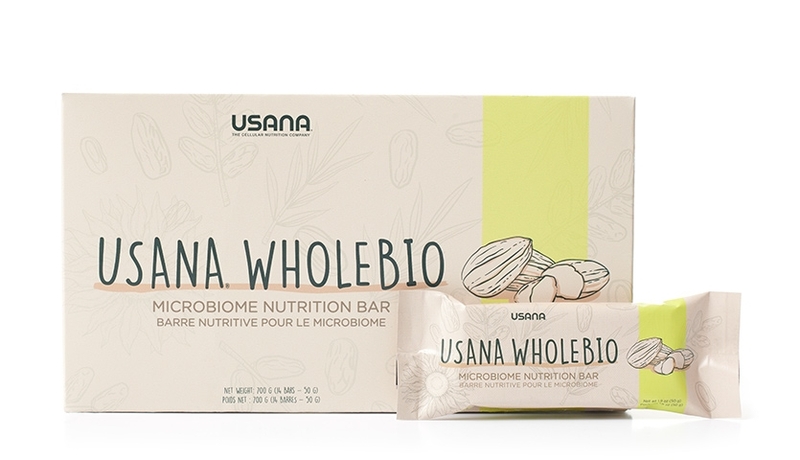 Can I eat the USANA WholeBio bar if I have food allergies? 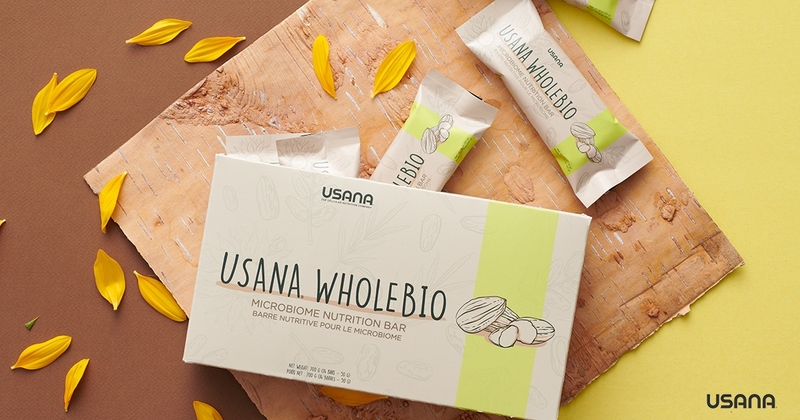 The USANA WholeBio bar should not be consumed by anyone with allergies to any of the ingredients, including sunflower seeds, peas, or almonds. Is this a protein bar? No. This isn’t specifically a protein bar, but it is still a good source of protein. No. This bar is not a meal replacement because it doesn’t have all of the vitamins and minerals that would be required to meet the definition of a “meal.” It is meant to be consumed as a snack as part of a healthy diet. 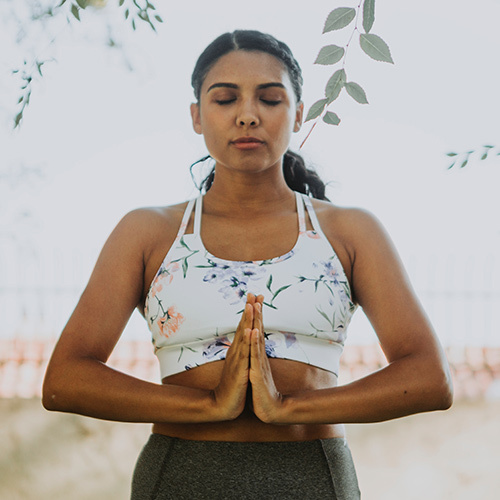 The probiotics introduce beneficial bacteria to your gut and the prebiotic fibers help feed and nourish helpful bacteria so they grow strong and capable to support your long-term gut health. Think of the probiotics as the seed and the prebiotic fibers as the water and sunlight that help the seed sprout and grow. The microbiome is all of the microscopic organisms that live on and inside you. This includes bacteria, fungi, and viruses. Each region of the body has an individual microbiome essential for your overall health and wellness. However, when the term microbiome is used, it is often referring just to the bacteria in your gut. What type of sweetener is used? 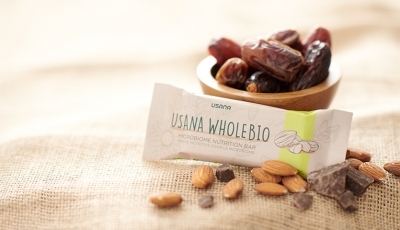 The USANA WholeBio Bar doesn’t contain refined sugars or artificial sweeteners. The sweet taste and sugar content of this bar comes from a date paste combined with chocolate. Date paste is a concentrated ingredient that provides a boost of sweetness and balances well with the decadent chocolate. The protein in the USANA WholeBio Bar comes from a combination of pea protein concentrate, pea protein crisps, and diced almonds. Sunflower butter and diced almonds are the primary sources of fat for the bar. Do I need to refrigerate this bar? No, but it may increase the shelf life of the bar. Your WholeBio bar may become very firm when cold, so we recommend bringing it to room temperature before eating. Can I add this bar to my shakes or smoothies? Can I cook with the WholeBio Bar or heat it up in the oven or microwave? Yes. The probiotic strain used in the bar is very stable, so it should not be damaged by heating in the oven or microwave. But heating the bar may affect texture or flavor. A close look at the digestive system and how it works. Learn how nutrients are extracted from the food you eat. Follow your food from fork to elimination. *Individual results may vary. The 5-Day RESET program lowers your daily caloric intake and recommends moderate exercise for best results.